Tetris Heat Change Mug: Board changes when hot liquids added. 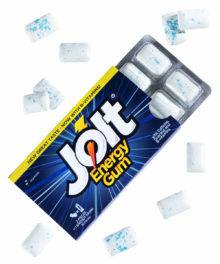 Add a hot beverage to change the game board. 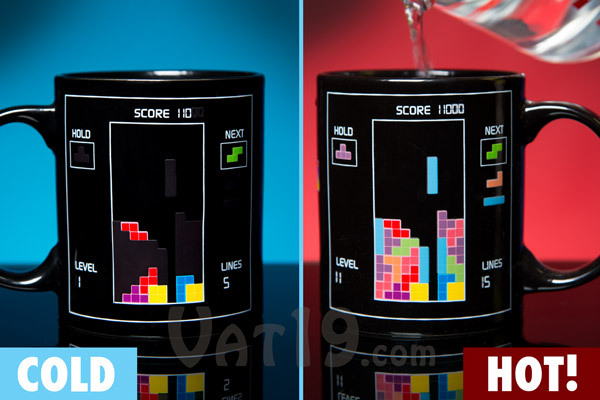 Trumpet your love for tetrominoes with the Tetris Heat Change Mug. This twelve-ounce coffee mug changes its appearance when you pour in a hot drink. A near-empty matrix is displayed when cool, but fills in considerably in the presence of heat. The same game board is featured on both sides of the ceramic mug. Hand wash only. We like heat-changing mugs. And we love the 80s. So, when we saw the Tetris Heat Change Mug, it was like we were meant to be together. It's like the Tubbs to our Crockett. 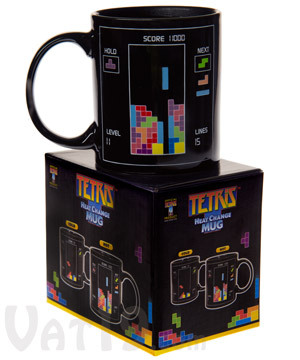 To fire up the Tetris Heat Change Mug, simply add a hot beverage. Within seconds, it will transform into a far more colorful game screen. Simply add a hot beverage to change the "game" on the mug. Rocking the Tetris Heat Change Mug will broadcast to anyone nearby what you don't have time to say. Namely, "I love Tetris. This may make me a bit of a nerd, but avoiding me certainly won't get you a ride in my Ferrari." 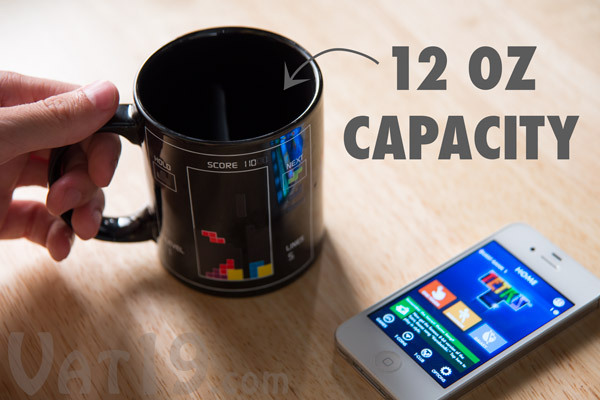 The Tetris Heat Change Mug holds 12 ounces (354 mL) of liquid. 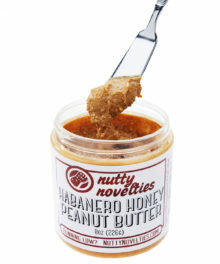 Beware knock-offs, imitators, thieves, and hooligans! The Tetris Heat Change Mug is an officially licensed Tetris product. So, it's got the real Tetris logo, look, and feel. You're not going to open the box and see "Tetrolis", "Titris", or "Tris" written on the side. 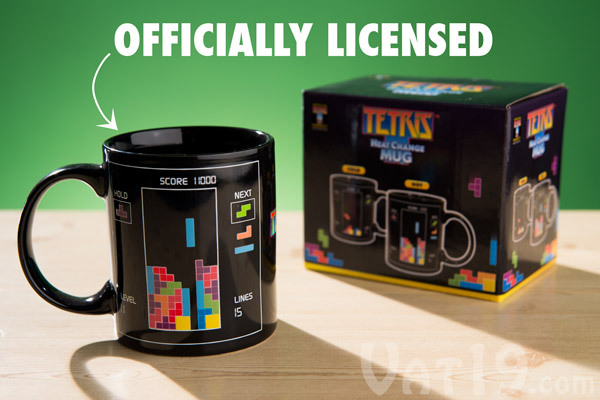 The Tetris Heat Change Mug is an officially licensed product. Question: Can I actually play Tetris on the mug? 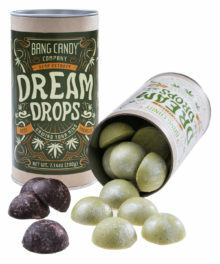 Answer: No. It's not an actual working game of Tetris. However, it is a fully working and automatically updating version of a drinking device. Question: How long does it take for the image appear when a hot beverage is poured into the mug? 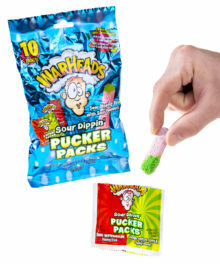 Answer: About 10-15 seconds depending on the temperature. Answer: The heat changing elements should last forever. However, the parts of the image that are heat activated will fade when the drink cools. We found that a hot beverage can keep the image fully drawn for at least 30 minutes. Question: Is the image the same on both sides of the mug? Question: Can I put it in the dishwasher and microwave? Answer: No. In order to preserve the heat-changing glaze, the Tetris Heat Change Mug should be hand washed.